What's New at Frameworks Gallery? Tonight was the opening reception for the show " Forces of Nature" which features artwork inspired by nature painted by fellow artists Julie Mann and Theresa Forman and me. The show is at the Frameworks Gallery in Marietta, GA and runs thru April 20, so you can still see the show if you didn't have a chance to come tonight. 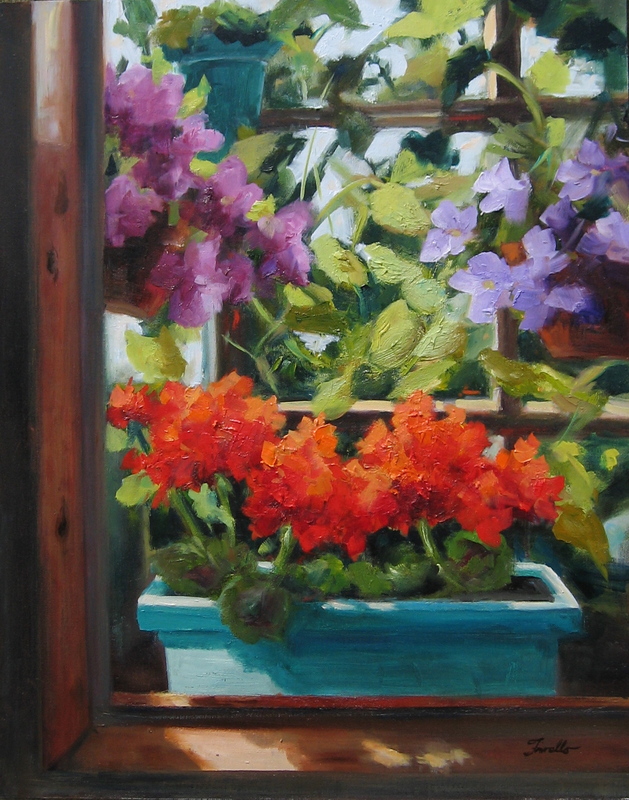 The show includes a wide range of nature scenes including landscapes, water scenes, skies, and florals- something for everyone. 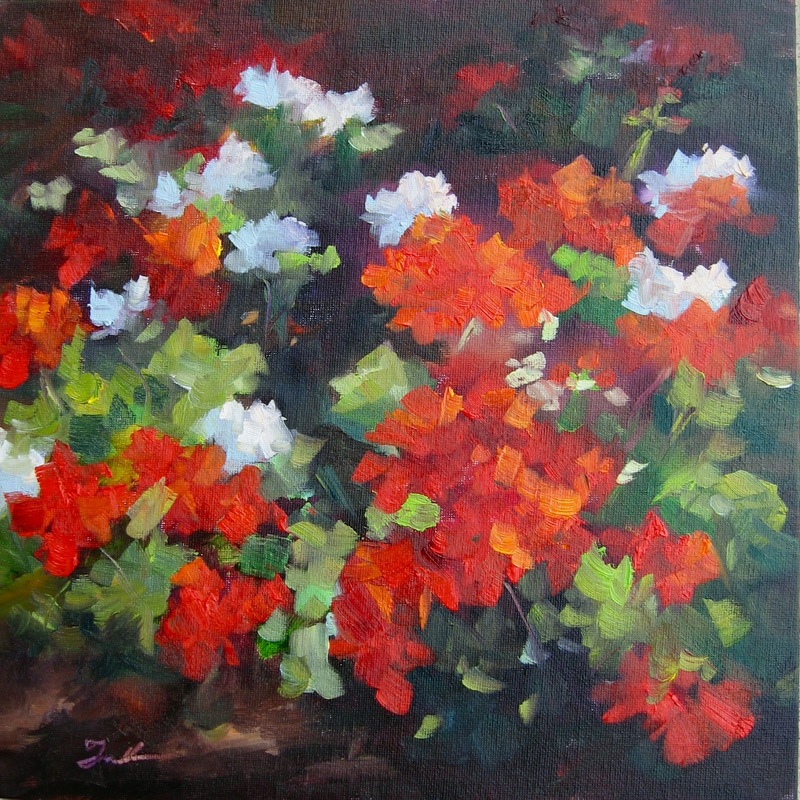 Each artist also donated a painting for a silent auction to restore landscape to beautify the nearby East Cobb Park which was damaged in an EF-1 tornado which struck earlier this month. The silent auction winners were announced at the end of the evening. 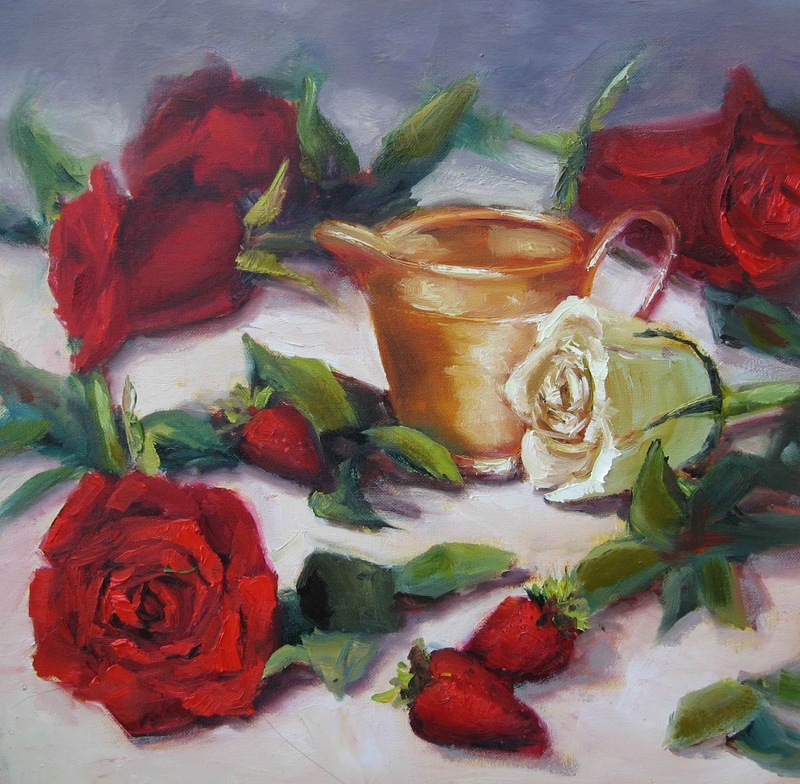 Attended a 3 day oil painting workshop with Laura Robb in Santa Fe last week. I first saw Laura's work in a gallery in Scottsdale last year and immediately loved it. I tracked her down and have been on a waiting list to get into one of her workshops. She only teaches a few time a year, so I felt lucky to have the opportunity to study with her. Rather than doing complete paintings, we focused on doing lots of studies, primarily of pears to practice seeing and painting simple forms. Kind of like practicing scales on the piano. 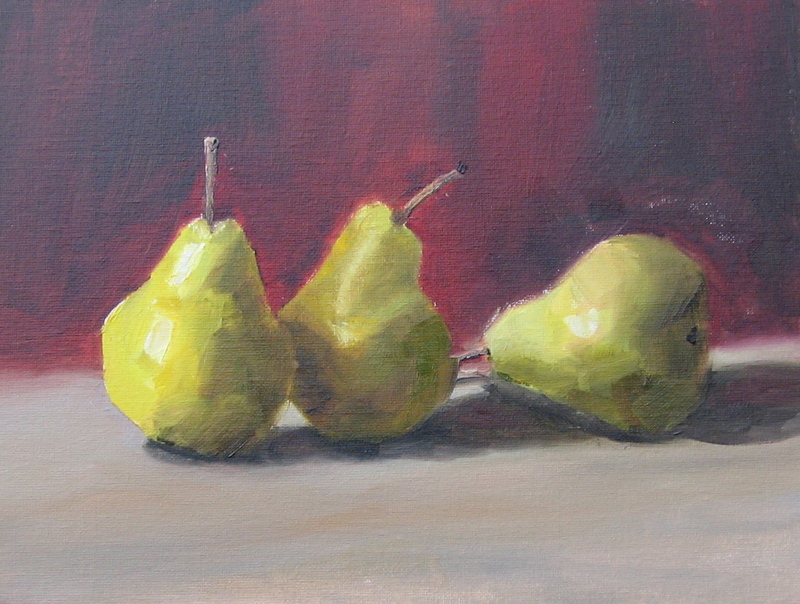 Here are 3 of my pear studies and also a photo of Laura demonstrating. She is a generous instructor who communicates clearly, a great artist and nice, positive person so when you get all 3 of those characteristics in a workshop instructor it's always a good experience. I would highly recommend studying with her if you are interested in her style of work. We did "graduate" to some more complex arrangements on the last day and I'll share them in upcoming posts. With the warmer than usual weather, Spring has definitely arrived in full force in Atlanta (along with a record breaking 9000+ pollen count). Just going outside and seeing all the colors can't help but bring a smile to your face. Spring is a time of optimism, energy and color. 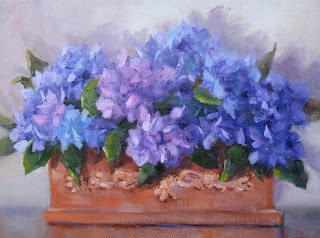 I chose hydrangeas for today's post as my hydrangea plants are just starting to wake up from their winter's nap. It's exciting to see the transformation from winter ( I keep fearing those"brown sticks " where my beautiful plants used to be mean they must be dead) to the first buds popping out in spring. Enjoy the spring colors and nature's invitation to get outside! Did a more casual still life set up with roses and leaves the other day. My aim was to achieve a little more random pattern than a formal still life set up and to create a feeling of moving back in space towards the gold pitcher. 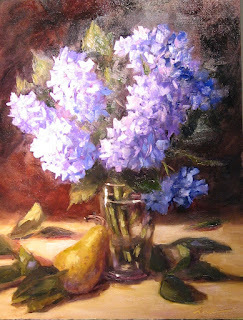 Taught a fun, new workshop this weekend at the Art School of Sandy Springs in Atlanta- Painting Flowers Alla Prima in Oil. Shared the approach I like of doing a transparent color block in then coming in with a 2nd phase with opaque paints while the first layer is still wet. It feels really natural to me and helps the colors to stay clean and beautiful- especially important for painting flowers. This was the demo painting from day 1- I apologize for the glare, still really wet when I took the photo on the easel under really strong light. Had a great group of students and really appreciated their openness and willingness to suspend their usual way of doing things to try something new. I've heard the saying from Eastern philosophy that the way one becomes a master is to keep a "beginner's mind". That is, approach each new learning situation as if you are a beginner, don't have all the answers and are open to soak it in anew without any preconceived opinions. If you come in thinking you already know, there's not much possibility for new learning. Tomorrow I'm off to a workshop with Laura Robb, so I will remember to pack my "beginner's mind" as well to make the most of that workshop experience. Today marks my one year anniversary of starting this blog. So far, I have shared 213 posts. I had attempted a blog back in 2010 and kept it up for a total of 2 days, so being consistent over the past years feels like an accomplishment. What was the difference between the 2 attempts? Why could I be consistent the 2nd time around when the first time fizzled out after only 2 days? As I see it, the first time I was doing a blog because "everyone" said I "should". It seemed like a good idea. Of course any sentence containing the word "should" typically comes from guilt or fear and ,at least for me, has little staying power ( like" I should avoid eating so much chocolate"...or put in your favorite indulgence, you know how well that's going!). Logically what you "should" do makes sense, but as Tony Robbins says, unless you have a big enough WHY, you will not make a change in your behavior. The notion that you "should" do something is typically not a big enough reason WHY to motivate you over time. The second time around, I saw a new reason to create a blog. To have it be a platform to inspire others and share what I am doing as an artist and what I am learning in the hopes that it may contribute to others. Art has made such a difference in enhancing the quality of my life, that I want to encourage others to include art in their lives- whether as an appreciator or a creator. Hence the title of this blog: " Art Elevates Life" . So if you are stuck on something, or keep trying and giving up, take a look at WHY you are doing it. Does it seem like a "good idea", it's what "they" say or everyone else is doing it? You have the opportunity to really look and see if it serves your purpose or not and choose. And if you choose yes, create a more empowering context or more compelling "why" that may help you stay the course, even when you don't feel like it. I hope you have enjoyed reading my posts and maybe even gotten a tip or bit of inspiration along the way. If you have any feedback or suggestions for year 2 topics you'd like to hear about, please send them my way. Thanks for following! Hope your day includes some art & beauty. I've wanted to tackle this subject for a while in oils. I did it in watercolor several years ago and the wet into wet approach worked really well. But had to approach it differently in oils. The challenge was to keep a pattern of sunlight despite the busy-ness of the subject matter. I started it several months ago and put it away- almost ready to scrap it, but the other day pulled it out again, restated the light passages and am now declaring it complete. The lesson of the day was never give up- you just might not be finished yet. I guess basketball is more like painting than I realized. You need a lot of time on the court ( I call it "brush mileage"), lots of failed attempts to learn from and an attitude that persistence will pay off in order to succeed and grow. I'm not a sports fan by any stretch of the imagination, but sports analogies can sometimes help drive home a point for artists too. When I coach fellow artists or students, I always encourage a "batting average " mentality. Major league players don't hit 100% of the balls thrown over the plate. If they hit 3 out of 10 they are probably considered a hero and will end up in the hall of fame someday. So why do we as artists expect everything to turn out? Whether it's show entries or gallery submissions, we are going to hear our share of "No's, or rejections along the way . Even when creating the artwork we will have some pieces that just don't turn out. If we expect 100% "Yeses" or wins, then we will undoubtedly be disappointed. But if we have a more realistic "batting average mentality", then we can avoid being upset or disempowered by situations and instead have a healthier perspective that it's just comes with the territory and is part of our artistic journey. This is in no way to suggest lowering your standards of excellence, but just to keep a healthy perspective. You can remain committed to a goal or outcome but not attached to it. If you are committed and it doesn't turn out, you are left with your commitment and the possibility to take another action towards fulfilling on that commitment. If you are attached, making it mean something about you, then you will just left upset. If your perception of the outcome is greater than your expectation you'll be satisfied. Conversely, if you expected more than you perceive you got, you will be dissatisfied. So if you expect 100% from all your artistic endeavors, it's unlikely that you will ever be satisfied. So don't set yourself up for being upset. Be realistic. Take action. This time at bat you may strike out or get a hit or maybe even a home run. You don't know till you try. What you do have control over is making the effort to get up to bat. And in the words of Winston Churchill, "Never, never, never give up". Spring is my favorite season of the year. 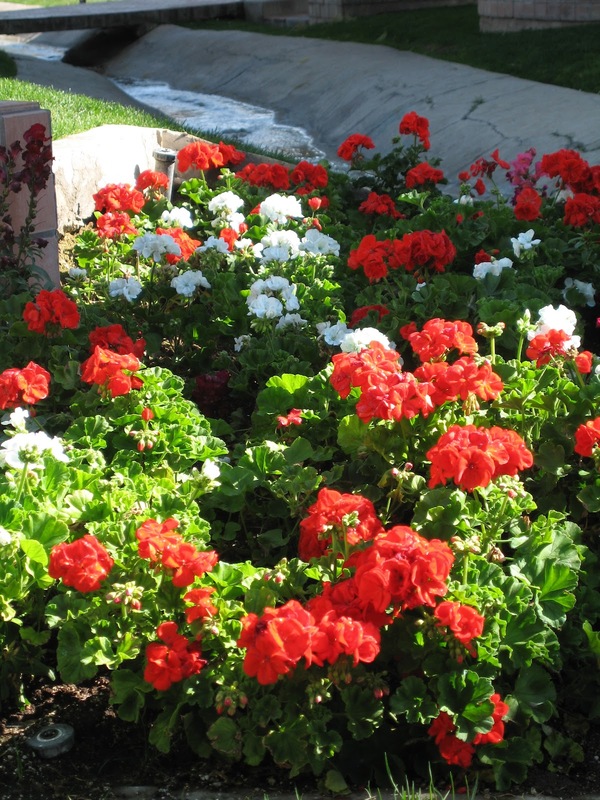 With the changing of the clocks this weekend, warmer temperatures and colorful flowers starting to pop out in gardens, Spring is definitely upon us. It feels to me like an uplifting time of hope, energy and optimism after a grey, cold winter( even here in Atlanta the winter, while not as challenging as the North, can be dreary). 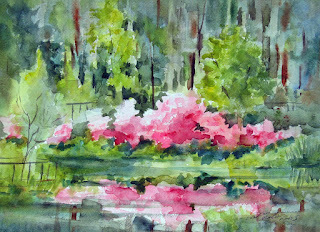 Another annual spring "rite of passage" is the Azalea Festival at Callaway Gardens in Pine Mountain Georgia, about 90 miles from Atlanta. For the past 7 or 8 years, I've been taking students there each Spring to paint on location in the gardens. We will be going again for a weekend workshop April 21-22. If you'd like to join in the fun and spend a beautiful weekend outdoors painting the joy of spring, call Callaway Gardens Education department at 706-663-5153 or email education@callawaygardens.com. Feel free to contact me at patfiorello@aol.com if any questions. Wherever you are, I hope you take notice and appreciate the return of Spring. Have a beautiful day! 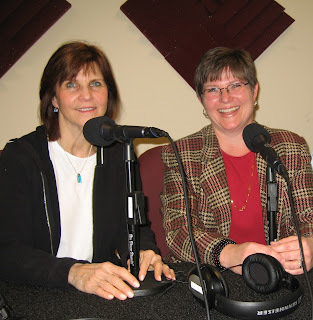 Yesterday, I was interviewed by Vanessa Lowry for her ongoing radio series "Art as Worship". Vanessa is an author and is exploring the relationship between art & spirituality by interviewing a wide range of artists ( visual artists, writers, musicians etc..) with whatever their definition of spirituality is. For me, I didn't approach the topic of spirituality from a traditional religious approach, but from the vantage point of the Human Spirit. I see 3 areas where art overlaps spirituality for me: appreciating, creating and connecting. Appreciating means noticing, valuing and being grateful for the beauty of the world around me and helping others to see that thru my paintings. Creating is the pure connection with the spirit, the energy and aliveness that is present when we are creating something whether we are creating a piece of art, music, a casserole or a spreadsheet. Whatever form creating shows up in your life I'm sure that's when you feel alive. The experience to start with nothing or just raw ingredients and soem inspiration and then creating something is true magic. Connecting is sharing the universal/eternal nature of art with others, as well as sharing with other artists and teaching others to grow while on their own artistic journey. AM on Empower Radio. You can click "Listen Live" at that time or listen at your convenience from the archives after the show airs. Here I am with Vanessa( right) after yesterday's taping. Do you paint to please others? Here's a recent painting that includes some of my favorite things-memories of my time in Tuscany where the trumpet vines seem to dance and their bright orange color is a joy. I love the clusters of villages with the orange roofs. The cypress trees also are classic Tuscany (although I learned on my last trip that they were not indigenous to the area, but were brought in to protect the vineyards from wind - can't guarantee the accuracy of that- but it sounded good to me). 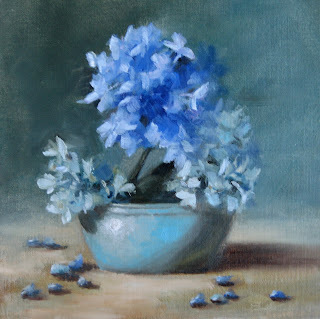 Artists can learn a lot about HOW to paint from instructors and other artists, and will ultimately gravitate to a process that suits them, but I believe the choice of WHAT to paint is very personal. The artist's selection tells you something about what they are passionate about or connect with on some level. I once had an instructor who advised me to stop painting "pretty scenes". I was initially taken aback by his comments and quite upset, but once I stepped back from the situation I decided to let go of his advice. I need to paint what I love and what get's me excited and inspired to paint. Maybe I'm a hopeless romantic, but I just want to look at, paint and share things that are beautiful and feel happy. I also had another instructor who was teaching us with her own reference photo's of farm scenes. Finally I told her I was not going to paint any more barns. Although I could paint a beautiful barn ( I even have one of my barn paintings published in the book Splash 11, Best of Watercolor by North Light Books), I have no personal connection with them. I grew up in Brooklyn NY, so don't have any fond personal childhood memories about barns. I can paint them, but it's not as exciting to me as other subjects. Many of you know before painting full time, I had a prior career in marketing. Many artists have come to me over the years and I have provided coaching on marketing, goal setting and their art careers. 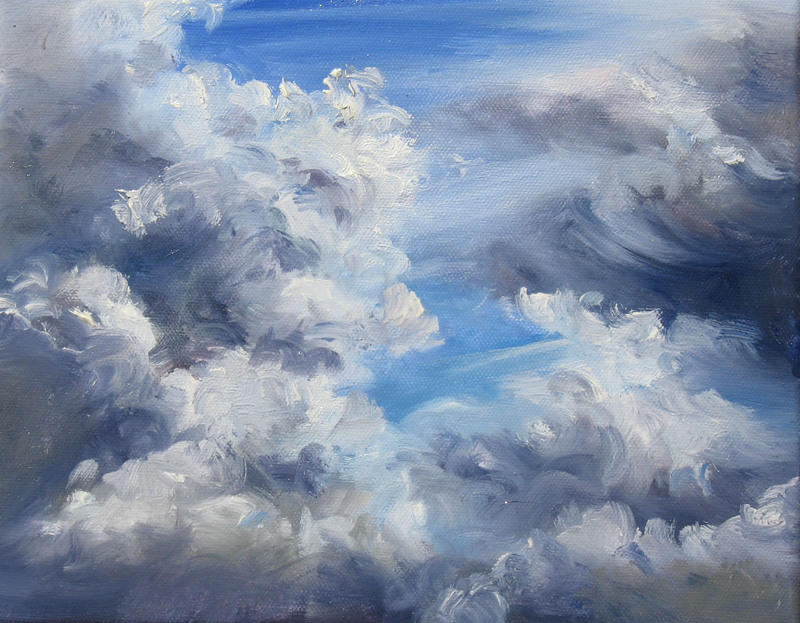 Probably one of the questions I'm asked most often is, "What should I paint?" as artists are questioning if there's something that the "market" wants and if they should be led by that. My reply is always the same "Paint what you love. If you love it, there are undoubtedly other people who love that too. The job of marketing then is to match your work up with that audience. The art market is varied and you don't need everyone to love your work, just a big enough audience for you to make a living (which is a very, very small % of the 7 billion people on the planet). Do what you love. Be true to yourself and it will show in your work. If you are inauthentic and disinterested, that will eventually show up to and the joy will disappear from your painting. I love the Bill Cosby quote I started out with at the top of today's blog post. It applies to many areas of life, but is certainly fitting for the choices we make as artists. I'll end with another quote which helps me stay focused. When asked about trends in art over time, Robert Genn of the "Painter's Keys " replied "Quality never goes out of style". Thank you Robert for getting to the bottom line. So do what YOU love and do it with all the passion and excellence you can! If you are ready for a fun and creative vacation, consider joining in on my upcoming art trip to France. We combine painting with exploring the beautiful Champagne and Bourgogne regions for a week of immersion in art and beauty. I went to my first workshop, also in France, after painting for only a few months. That was 17 years ago . It changed my life. I really didn't know what I was doing when I signed up. The opportunity to go to France and just paint and see new things and places sounded good, so I jumped in with my 3 months or experience and little watercolor kit. I learned so much and loved the opportunity to be totally immersed in art & beauty, meeting people who were passionate about painting and being away from the routine and distractions of everyday life to just focus on painting. I was hooked. I've been traveling and painting ever since and am now grateful that I have the opportunity to share these types of enriching experiences with others. These trips are a great opportunity to learn as an artist, but also to grow in many other ways. Please contact me at patfiorello@aol.com if you are interested or have any questions. There are only 3 spots remaining. Feel free to share with anyone else who might be interested. The trip is open to artists of all mediums and experience levels, even total beginners who might be ready to learn something new. I loved this sunlit garden full of geraniums and the pattern of light and shadow they formed. I use a method where I start with transparent paint, then add opaques later on to keep the colors bright and clean. Believe it or not this is how the painting started out as an abstract pattern of shapes. Then I pulled the lights out from the dark. 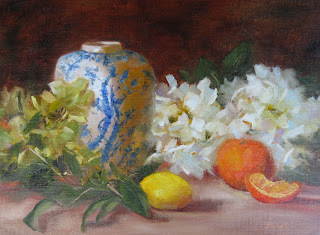 I will be teaching this approach in my upcoming workshop Painting Flowers Alla Prima in Oil in Sandy Springs, GA later this month. 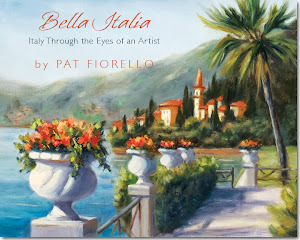 If you want to learn more about the workshop, please email me at patfiorello@aol.com. This was the original photo reference which inspired the painting.